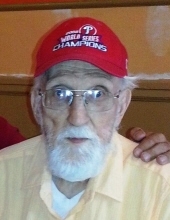 Joseph Jatko, 94 of 303 South Grape Street, Mt. Carmel passed away on Saturday April 6, 2019 at Mountain View Manor Nursing and Rehabilitation Center, Coal Township. Born in Reliance a small patch outside of Mt. Carmel lon April 24, 1924, he was the son of the late Michael and Anna (Trevitts) Jatko. He graduated from Mt. Carmel High School. Joseph retired after working for 30 years as a forklift operator for the Keebler Baking Company in Philadelphia. He was a member of SS Peter and Paul Ukrainian Catholic Church in Mt. Carmel and he was a past president of the Mt. Carmel Sons of Poland. He was very active with the Ed Romance Chapter of the Sports Hall of Fame. Joe was an avid Philadelphia Phillies fan. Surviving are two grandsons, Joseph Purcell, Jr. and his wife Sheryl of Coal Township and Brandon Purcell and his wife Tara of Coal Township; three great grandchildren, Rebecca, Rachel and Sarah Purcell, five great-great grandchildren and nieces. In addition to his parents he was preceded in death by one son, Joseph Purcell in 1987 and one brother, Michael Jatko in 2006. Divine Liturgy will be held at 11:00 am on Friday, April 12, 2019 in SS Peter and Paul Ukrainian Catholic Church, Mount Carmel. Interment will follow in SS Peter and Paul Ukrainian Catholic Cemetery, Mt. Carmel Township. A viewing will be held on Friday morning from 9:00 am until 10:45 am at the Joseph J. Stutz, Inc. Funeral Home, 40 South Market Street Mt. Carmel, Joseph J. Stutz, III Supervisor. In lieu of flowers expressions of sympathy can be made to SS Peter & Paul Church 131 North Beech St. Mt. Carmel, Pa. 17851. To leave a condolence for the family, please sign the guestbook at www.stutzfuneralhome.com. To send flowers or a remembrance gift to the family of Joseph Jatko, please visit our Tribute Store. 131 North Beech Street Mt. Carmel 17851 Pa.
"Email Address" would like to share the life celebration of Joseph Jatko. Click on the "link" to go to share a favorite memory or leave a condolence message for the family.